UPDATE: The Go Fund Me account for Lance Boston reached its goal of $10,000 on Friday. Since Dec. 22, Lance Boston has been wearing a ZOLL LifeVest, a wearable defibrillator and heart monitor while he tries medications to strengthen his failing heart. The vest is something his cardiologist urged him to wear, but something his health insurance denied to cover. Lance Boston checks his monitor, which is connected to a LifeVest underneath his shirt. The vest, which he wears 24/7, monitors his heart and can deliver a shock in the event of an emergency. The vest is something his cardiologist prescribed while he tries a drug treatment to strengthen his heart, which is in failure. Boston is currently appealing a decision from his insurance company, which denied coverage of the vest and deemed it medically unnecessary. Lance Boston wears a Zoll LifeVest, which monitors his heart and can deliver a shock if a life threatening rhythm were detected. The vest, which costs about $3,000 a month, was denied coverage by Boston's health insurance. 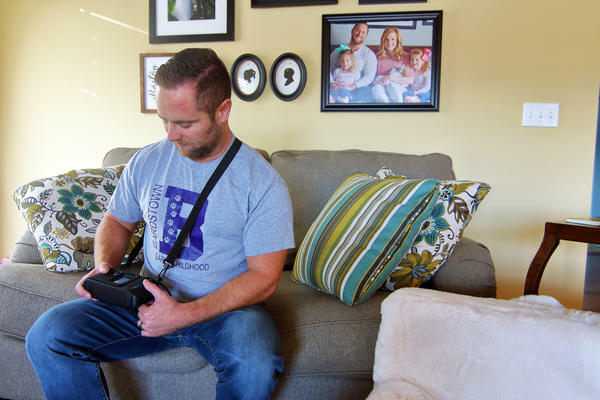 Lance Boston’s heart is failing, and the Bardstown man is appealing his health insurer’s denial of a potentially life-saving wearable defibrillator. While others returned to work after the New Year holiday, Boston was still homebound, waiting for his doctor to clear him to return to the office. The Bardstown City Schools’ special education director found himself in the hospital shortly before Christmas with a diagnosis he wasn’t expecting. “It was a pretty big surprise,” Boston said. He had visited a local doctor Dec. 14 feeling ill, having difficulty breathing and thinking he had lingering bronchitis or pneumonia. When his lungs didn’t sound right and two EKGs came back abnormal, he was sent to the emergency room for a chest x-ray and CT scan. The scans revealed a significant amount of fluid on his lungs, and lab work showed issues with his heart. Boston was sent home that night with diuretics to help with the fluid and was told to follow-up with a cardiologist. A friend helped quickly connect him with a cardiologist in Louisville who was able to get him an appointment that Monday morning. After reviewing the tests, Boston was admitted to Jewish Hospital in Louisville on Dec. 18. A heart echo determined that Boston had an ejection fraction of 15 percent — normal is between 50 and 75 — and he was in advanced heart failure. He was diagnosed with dilated cardiomyopathy, causing an enlarged left ventricle that decreases his heart’s ability to pump blood. Doctors said its possible a virus had attacked his heart at some point, causing the issue. Originally, he said, the doctors were leaning toward installing an internal defibrillator, but decided instead that the best course of action would be to try a treatment of medications aimed at strengthening his heart without the surgery. But because of his weakened heart and the chance of a collapse, Boston would also need to wear a LifeVest for three months while waiting to see if the treatment would work. 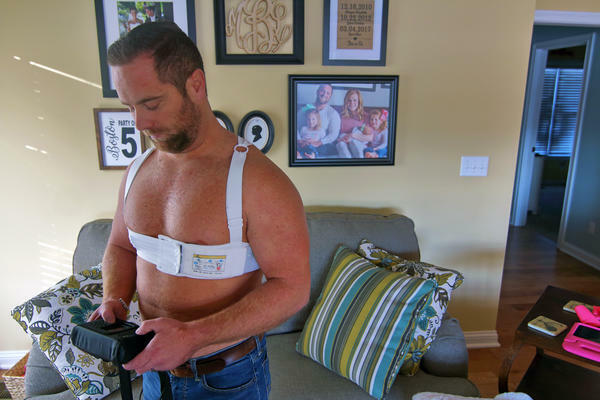 The vest is a wearable defibrillator for patients at risk of sudden cardiac arrest (SCA). According to ZOLL, which supplies the vest, the device provides “protection during their changing condition while permanent SCA risk has not been established.” The vest monitors the heart and can deliver a shock to restore normal heart rhythm if needed. The vest, which Boston said costs an estimated $3,000 per month, is where he hit a roadblock. Boston’s need has not gone unnoticed in the local community. A friend created a Go Fund Me account on his behalf and in a little over a week more than $8,000 has been raised to support the cost of the vest. While the support is a tremendous help, though, Boston is fighting to appeal the decision and said his doctor submitted the appeal this week. Boston said one of the most frustrating aspects of his situation is that the person who signed the document denying his request is a gynecologist, not a cardiologist. In addition to contacting members of the Kentucky State Employees Insurance Board, Boston has contacted Lindstrom Healthcare Advocacy Inc., a national organization that works with patients on medical appeals. Boston is not alone in his fight. In November 2016, Louisville television station WDRB reported on a 31-year-old southern Indiana veteran, Matthew Nunley, who was diagnosed with congestive heart failure after his heart was attacked by a virus. According to the report, Nunley’s heart was operating at only 10 percent capacity and he was prescribed medication as well as a ZOLL LifeVest. But like with Boston, Nunley’s insurance company, Anthem, denied coverage of the vest and he had to take on responsibility of the cost, according to the report. A later report indicated Nunley had appealed the denial the maximum of four times and also expressed frustration because, as with Boston’s case, the representing doctor was a gynecologist. In a time when stress should be avoided, Boston is stressed out. As a state employee, he finds the denial of coverage unacceptable. As a father to three little girls, he finds the situation frightening.